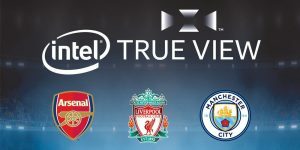 In partnership with Arsenal FC, Liverpool FC and Manchester City, Intel will deliver immersive experiences via Intel True View at Emirates Stadium, Anfield and the Etihad Stadium. From 10 March, fans worldwide can enjoy the biggest moments of the match from every angle, whether they’re watching the rights holders’ live broadcast and highlights or reliving the action post-match from the clubs’ official website, mobile app or social media. Intel True View re-creates the action on the pitch and presents that from an ideal vantage point or player’s perspective, using Intel’s data-processing capability to deliver the experience to fans. The deal struck by the three clubs means they will also provide the new footage to BT Sport and Sky Sports to help with live analysis when they cover matches at those stadiums. The process begins with volumetric video, the capture and rendering technique behind Intel True View. Using the volumetric capture method, footage is recorded from 38 5K ultra-HD cameras that include height, width and depth of data to produce voxels (pixels with volume). After content is captured, a substantial amount of data is processed with servers powered by Intel Core i7 and Intel Xeon processors. The software then re-creates all the viewpoints of a fully volumetric 3D person or object. That information renders a virtual environment in multi-perspective 3D that enables users to experience a captured scene from any angle and perspective and can provide true 6 degrees of freedom. Multi-angle views of a play: Intel Sports’ volumetric video process creates 360-degree replays and highlight reels from every conceivable angle, using 38 5K ultra-high-definition cameras. The sports industry is undergoing a period of significant change as consumer behaviour is shifting, driving technology, leagues and brands to address the expectations of fans. In 2018, technology investments into sports reached nearly $1 billion, continuing to drive the intersection of sports and technology. With smart and connected tools, Intel is uniquely positioned to enable the sports industry to capture, analyse and respond to new levels of insight in real time and create amazing new experiences for fans.